I have passed the French restaurant Michel Bistro (MB) on Lakeshore Avenue in Oakland many times. I remember stopping once and looking at the dinner menu and continuing to walk on by. The menu was short and had maybe one or two things I would consider ordering. Today we had book club to discuss The Hundred Foot Journey. My BFF suggested the meeting to be held at MB for brunch, after all, much of the book takes place in France. After looking at the brunch menu online, I was much more excited. 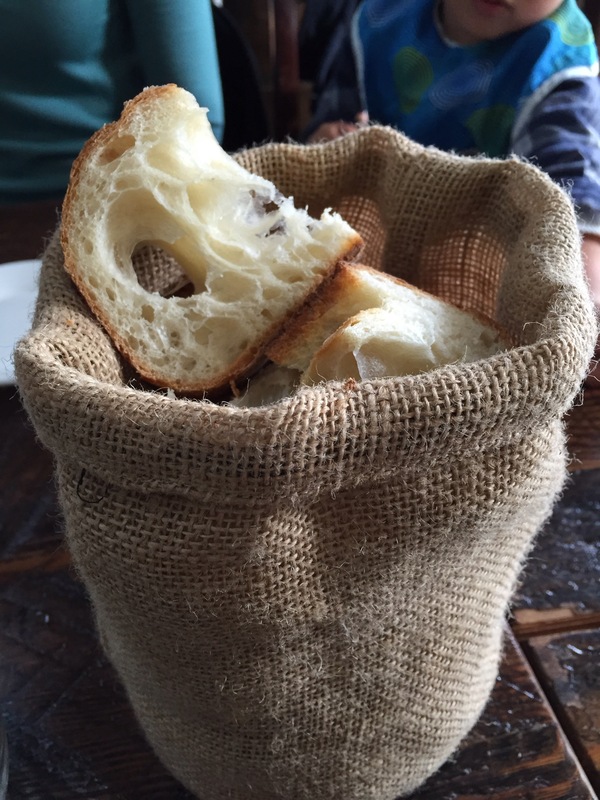 We started with coffee and a complimentary sack of bread. Cute, huh? My BFF and I had previously discussed sharing a couple of items, one sweet and one savory. 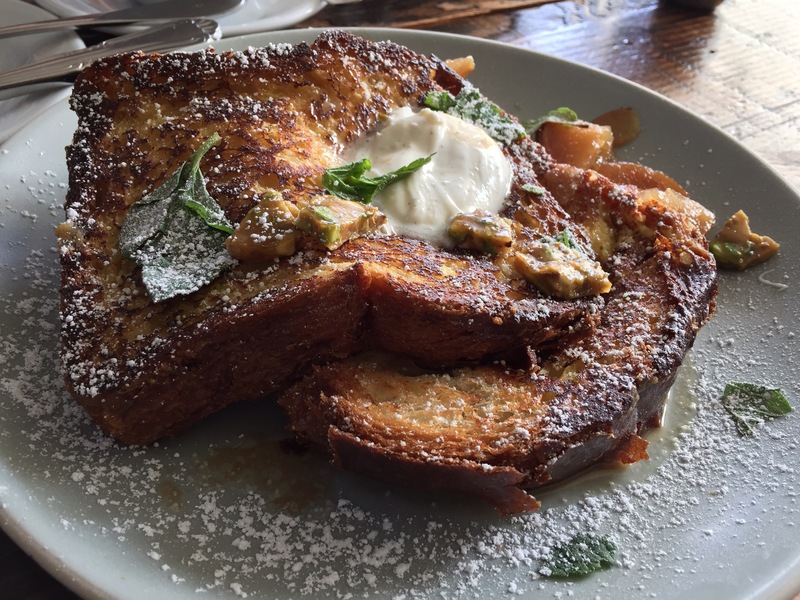 We ordered the Pain Perdu which is French for French toast. Their version had pear, house made mascarpone, and a pistachio brittle. It was very moist and eggy on the inside, but still had some crispness in the crust. It had the perfect amount of sweetness and was delicious. I found the pistachio brittle to be an extra nice addition. MB’s version of Eggs Benedict was the savory dish we chose and it was quite unique. 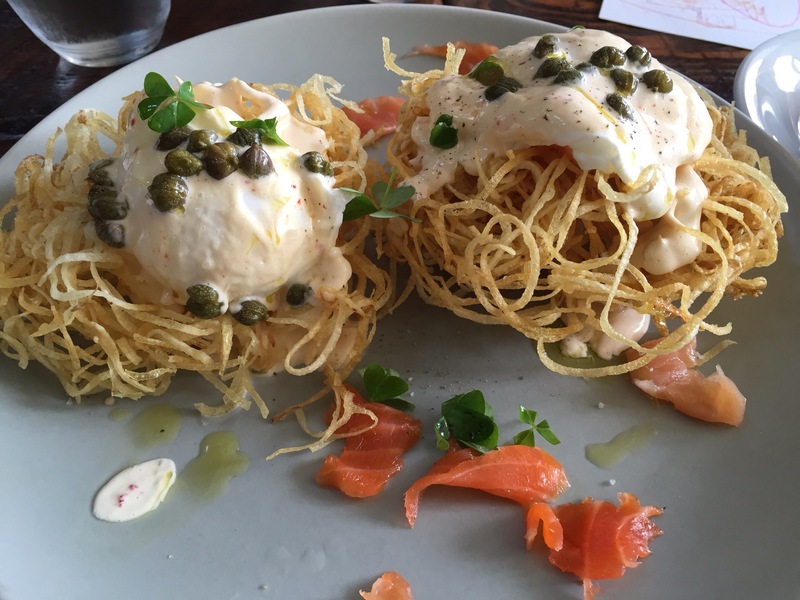 Instead of the typical English muffin on the bottom, they used a crispy potato nest. On top was a poached egg with hollandaise sauce and capers. Instead of salmon, they used cured trout. This dish was light as well as delightful. 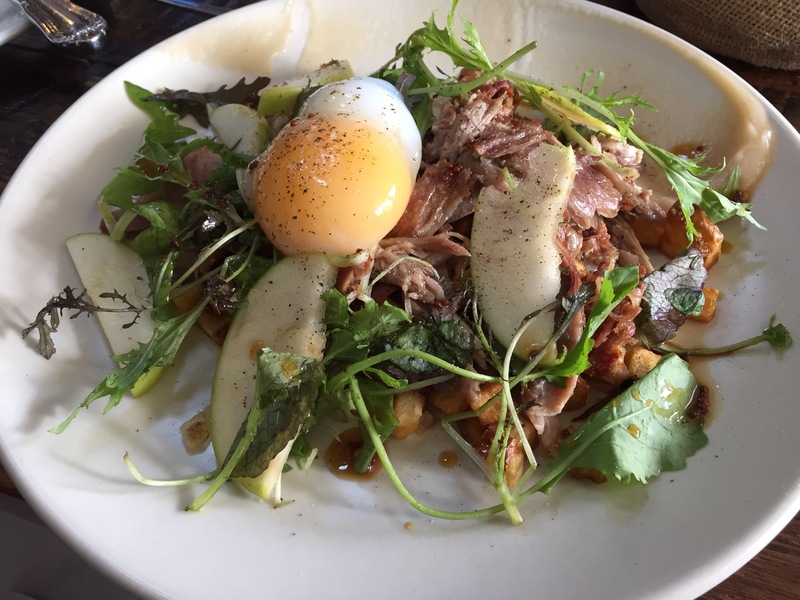 Another friend ordered the Duck Confit Hash which came with duck egg, apple butter, duck jus, and mustard greens. I had a bite and thought it was a good choice as well. She enjoyed her dish very much. A nice thing about MB is that they have a child’s menu at Brunch. 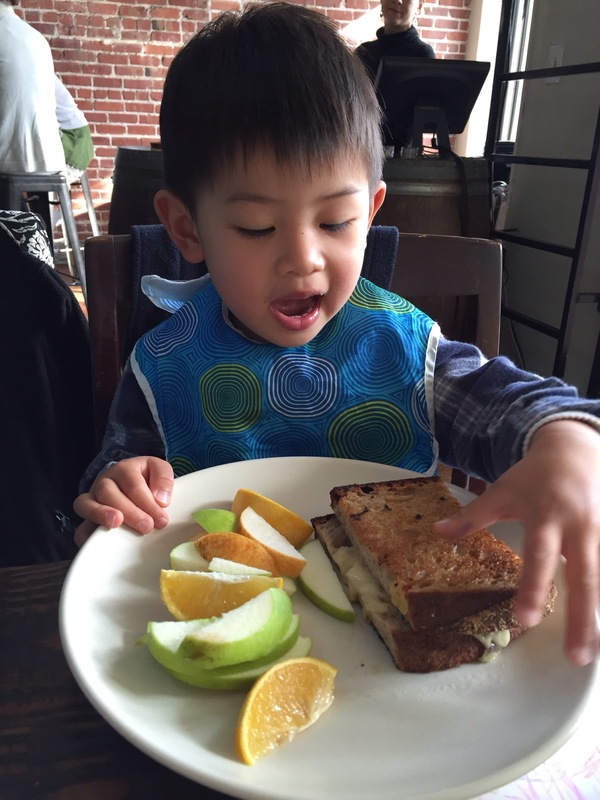 There are only a few options, but it gave one of my friend’s kid the opportunity to order a Grilled Cheese Sandwich. Can you tell he was pretty excited? 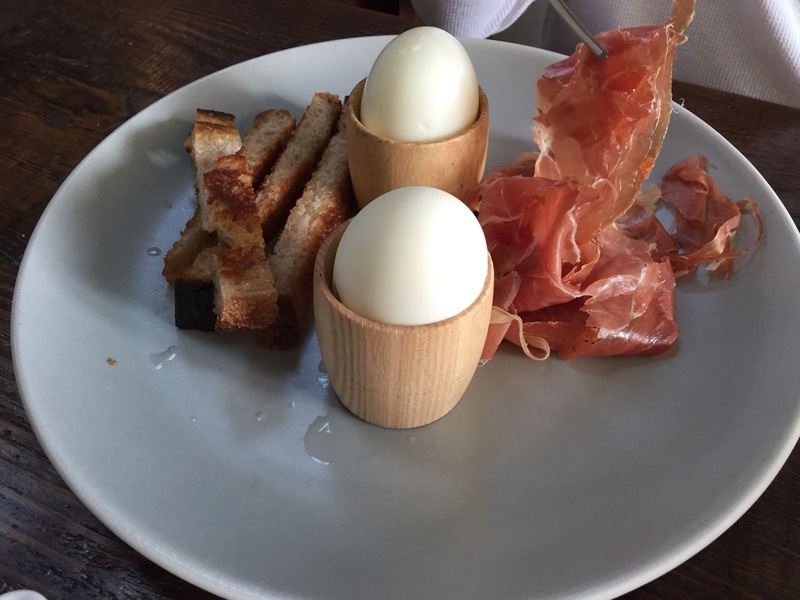 Her other son ordered the Ouef a la Coque, which were two boiled eggs, serrano ham, and brioche. Eating out of egg holders always gives me fond memories of my time in Paris. Having finally given Michel Bistro a try, I am very happy I did. I realize that this is really the only French restaurant in Oakland. It has a nice vibe, the staff are friendly, and the food is great. I definitely recommend Michel Bistro. I can’t wait to try the Eggs Benedict. What a twist! Michele- this restaurants got your initials written all over it.